If you are looking for a SKB 28” Deep Rack Case then do not look further than the selection we have at Absolute Casing. Every 28" deep rack frame we stock has been made with gasket doors and has a rubber seal to ensure the case is waterproof. Along with this, each of our 28-inch rack cases have shock absorbers in every one of their eight corners. To improve the strength and durability of the SKB cases they now contain an aluminium interior to increase the level of protection they can provide. An increased amount of protection ensures you can safely transport your belongings and delicate equipment. 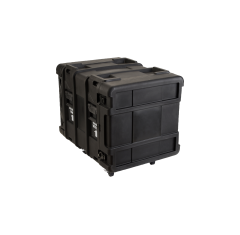 As well as being waterproof our 28 Inch Rack Cases are shock resistant, corrosion proof and crushproof. This allows the case to safely protect its content even in the most difficult and testing conditions and environments.